I am a local businesswoman, wife and mum bringing a revolutionary, award-winning, eco-friendly housekeeping service to busy homeowners in the Dunfermline, Kirkcaldy and north-west Edinburgh areas. What do Bright & Beautiful actually do and what makes us revolutionary? 1. Holistic housekeeping – bespoke cleaning, laundry, ironing and tidying in your home. 2. Strict security – we use professional procedures to safeguard your home and give you peace of mind. 3. Trusted team – our fully employed team are carefully selected and professional trained. 4. Pure products – we use eco-friendly and non-toxic products for a healthy home environment. I find that our clients’ love our attention to detail that brings the “wow” factor to their regular cleaning regime. Mr Dodds of North Queensferry says “Gill, great job done on the house, huge improvement. Pass on my thanks to the team! Really pleased! 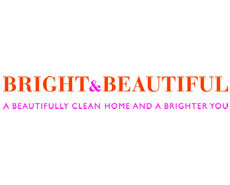 For more details visit our website, www.brightandbeautifulhome.com, or call Gill on 07874 835325.